We had so much fun during our V is for Volcano unit... Here are a few of the things we did as we learned about Volcanoes! By the time we reached letter V, we knew most of sounds and letters pretty well. We enjoyed watching the Starfall Letter V animations and drawing V's with chalk. We also did a craft (see below) that reinforced the shape of the letter V. Also, to review some of the words my older son was learning to read, I motivated him by drawing a volcano on top of his word list. Each time he read a word correctly, I would draw a bit more of a volcano picture. When he completed the list of words, I made the volcano "explode" all over the word list (by drawing lots of squiggly lava lines to cover up the words). It was a simple thing, but my 4-year-old loved it. Below are a few of the volcano-themed books we read. This beautiful, simple picture book shows how an island grows and changes after it is created by a volcano. This picture book is fun because it alternates between telling a legend about volcanoes and telling the scientific facts about volcanoes. This picture book tells the story of the birth of the volcano Paricutin in Mexico. My boys were fascinated by the true story of a volcano that emerged in a farmer's field. My kids loved this imaginative, make believe story about a young volcano having a temper tantrum. And it has a good lesson--Tristan the volcano learns in the end that it is better to control his temper so he won't be so lonely. This was a great nonfiction book about Volcanoes. The "chapters" were short enough for me to read to my 4-year-old (although it was still too dense for my 2-year-old). Of course, we had to do the classic vinegar and baking soda volcanoes in our backyard. My kids loved this and we went through a whole bottle of vinegar making volcanoes. To make a vinegar and baking soda volcano, pour some vinegar and red food coloring in a small container and then add baking soda for an "eruption." You can pile up dirt or playdough or sand around the container to make it look more like an actual volcano. For a little history lesson, we talked about memorable volcano eruptions in history from Pompeii, to Paricutin, to Mt. St. Helens. We pointed out these volcanoes in books we read, and I showed my kids some related video clips on YouTube. We made this Letter V is for Volcano craft. The "volcano" was a large V that I drew onto a piece of brown paper. I helped my kids practice cutting out the large V's themselves. Then, I cut out several small red and orange V's and they chose which small V's they wanted to glue on to their volcanoes as "lava." For a sensory activity, we made volcanoes out of play dough and played with dinosaurs and other action figures in the playdough volcanoes. During that time I also helped my children learn names of the parts of volcanoes such as vent, crater, etc. For snack time, we made strawberry volcanoes with whipped cream "lava." I simply cut the top off of a strawberry, placed the strawberry upside down on a plate, and squirted a little whipped cream on top. In addition, for dinner time, we had baked potato volcanoes with ketchup lava. My kids were very fascinated with our V is for Volcano unit and since we ended that unit, we have revisited the topic of volcanoes many more times in our books and pretend play. 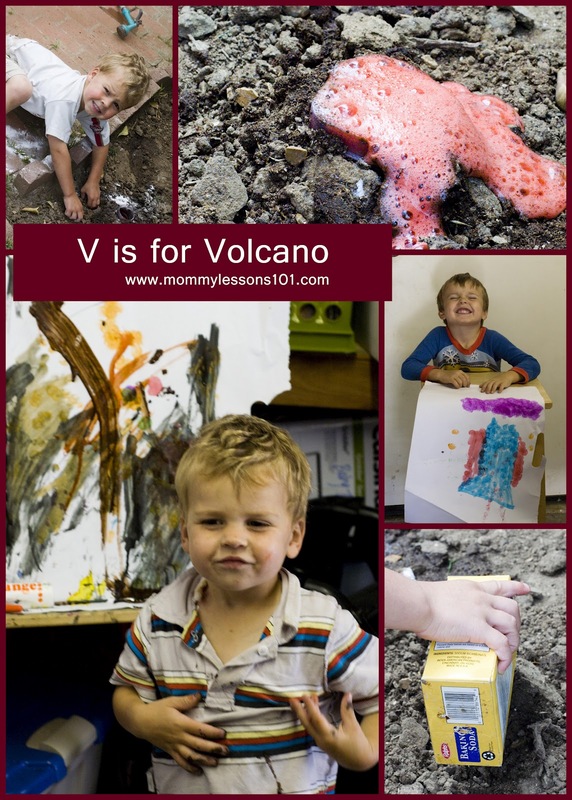 For more V is for Volcano ideas, see my Pinterest Board!